December 3rd 2018 - Competing in a stableford team format, 108 individuals came together Monday, December 3rd at Quail Valley Golf Club in Vero Beach in an effort to raise funds to support the South Florida PGA Foundation. Teams were comprised of one Professional and one amateur, and contest were held in the net, gross and professional divisions. Gusty winds and quick greens seemed to be no challenge for PGA Tour Professional Justin Hicks and his amateur Chris Hatfield as they captured the Gross Division title by 4 points. Hatfield is one of Palm Beach Counties best amateur golfers, and paired well with Hicks helping him capture his second title in this event. They earned 57 points. 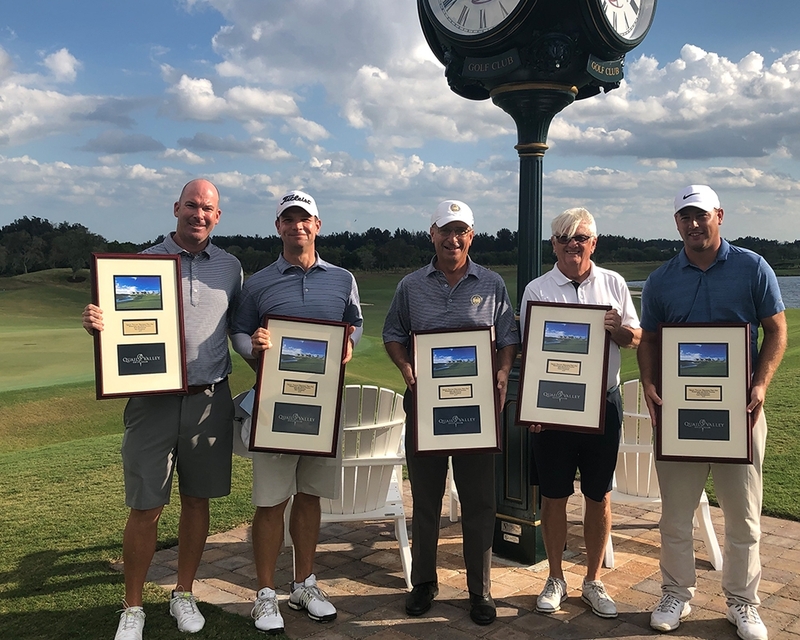 PGA Professional Jerry Impellittiere from Monarch Country Club and his amateur Bob Dewit earned 63 points taking home the trophy in the Net Division. Along with the team competition, Andrew Filbert, PGA Assistant Golf Professional at Royal Poinciana Golf Club in Naples earned 48 points to be named Low Professional of the event. This win helps Filbert cap off a fabulous year, after he was most recently named South Florida PGA Player of the Year earning a spot into the 2019 Honda Classic. This event marked the 6th Annual raising funds to support the South Florida PGA Foundation and the programs it administers including but not limited to Habitat for Humanity, Smiling Fore Life, PGA HOPE, Scholarships, Charitable Gifting and Junior Golf. Through this event more than $10,000 raised. The 6th Annual Quail Valley Holiday Pro-Am was supported by Heritage Creations, Lincoln Motor Company, Signature Golf and Tire Kingdom. To view complete results click here, or to learn more about the SFPGA Foundation click here.